The Reserve Bank of New Zealand Survey of Expectations is a New Zealand-wide quarterly survey of business managers. ACNielsen conducts the survey on the Bank's behalf. Respondents are asked for their expectations of future outcomes of a range of key macroeconomic data. 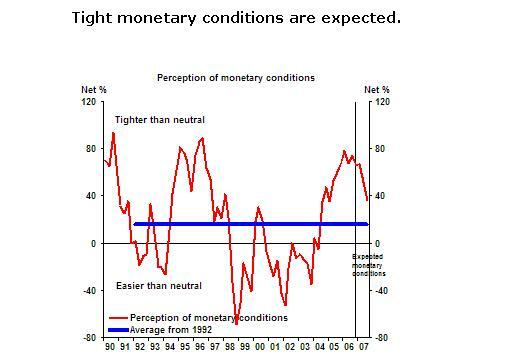 The latest RBNZ Survey of Expectations was conducted on the afternoon of Wednesday 8 November 2006. Note that the results of the survey represent expectations held by respondents and in no way represent the views or forecasts of the Reserve Bank. Graphs and figures in the following report refer to the mean expectation levels of respondents. nflation expectations for both the one and two year horizons have fallen. 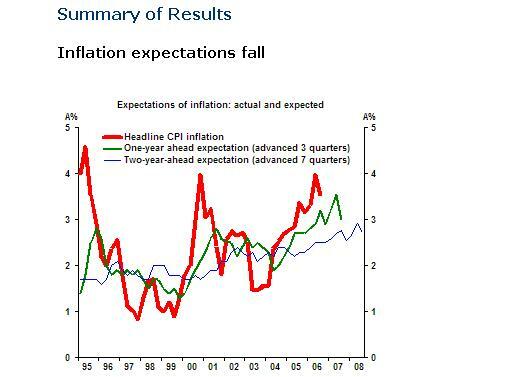 Average one-year-ahead Consumers Price Index (CPI) inflation expectations dropped significantly, to 3.0%. This is a fall of 0.5 percentage points on the one-year expectation recorded in the last survey. Two-year-ahead expectations also fell, from 2.9% in the last survey to 2.7% now. The median two-year rate is 2.8%. Expectations of quarterly movement in the CPI for the next two quarters also fell in this survey. On average, respondents expect a quarterly increase in the CPI of 0.5% in the December 2006 quarter, compared with 0.9% expected for the December quarter in the last survey. A quarterly increase of 0.7% is predicted for the March 2007 quarter.